Lambert, J., Gong, Y. & Cuper, P. (2008). Technology, Transfer and Teaching: The Impact of a Single Technology Course on Preservice Teachers’ Computer Attitudes and Ability. 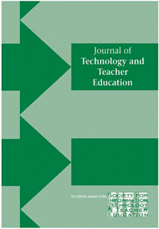 Journal of Technology and Teacher Education, 16 (4), 385-410. Waynesville, NC USA: Society for Information Technology & Teacher Education. Retrieved April 21, 2019 from https://www.learntechlib.org/primary/p/26064/.